3: "Ahoy from the Louis"
11: Thanks to the Louis! Mooring meeting with the Captain. From left: Sarah Zimmermann (IOS), John Kemp (WHOI), Rick Krishfield (WHOI), Doug Seiberg (IOS), Chief Officer John Jenner, Boatswain Blaine Blinkhorn, and Captain Andrew McNeill. The bongo net being deployed by Amanda Byrd using the forward A-frame. 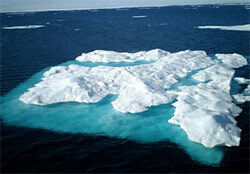 Massive ice block floating free from the main ice pack. 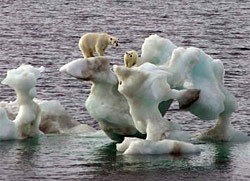 Mother polar bear and cub on interesting ice sculpture carved by waves. photo © Amanda Byrd. 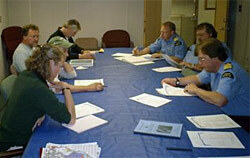 For information on licensing this image, contact AlaskaStock. When there was a sufficient amount of open water there was a CTD (conductivity, temperature, depth) cast at a depth of 500 meters. After the cast was completed, there were scientists buzzing all around with excitement taking samples from all of the water sampling bottles for processing. Amanda Byrd, from the University of Alaska, Fairbanks, also performed a plankton tow where she hung her bongo nets from the A-Frame on the starboard side of the ship. There has to be constant communication between the bridge and the scientists on deck in order to keep everything away from the three large propellers. She’s studying the zooplankton communities at less than 100 meters including: arrow worms, krill, copepods, and amphipods. The next day there was a meeting with Captain Andrew McNeill and Chief Officer John Jenner to discuss the logistics of the mooring operations. The Captain’s only concern was the amount of ice that may be surrounding the mooring sites, but was confident with the experience of John Kemp (WHOI) and the rest of the team. 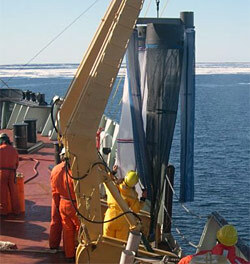 Later that day the LSL drove through the ice to the first of four moorings, the UAF/IARC Canada Basin Observatory (CABOS), and because the top portion of the mooring was 50 feet underwater, a transducer (a type of sonar device) had to be lowered into the water in order to locate its exact position. The LSL had to clear a large area so when the buoy came up it wouldn’t be under a piece of ice and be free of obstructions. After a lengthy ordeal of clearing the ice, the buoy popped up and the mooring was on the ship’s deck in less than two hours. Currently we are traveling towards the 150 deg. longitude line to the next CTD and mooring sights, but had to slow down to a crawl because of an interesting and exciting encounter; a polar bear was sighted swimming off of the ship’s port bow. It looked to be a juvenile, but is still considered to be very dangerous. Later on a mother and cub were also spotted on top of an extraordinary ice block.